Hughes Locomotive and Tramway Engine Works Ltd. In 1881 Hughes’ built two 3 ft (914 mm) gauge 0-4-0STs for the Liverpool Corporation Water Committee for use in the construction of the waterworks at Lake Vyrnwy in Wales. In 1881 the company ran into legal problems and in 1882 it was in receivership. Late in 1882 it reformed as the Falcon Engine & Car Works Ltd. and supplied three more locomotives of the same design for the railways at Vyrnwy. Again there are few records, but the factory remained busy with both railway and tramway locomotives and rolling stock. Among these were tank locomotives for Ireland, Spain and the Azores. Some were subcontracts from other firms, such as Kerr Stuart, at that time in Glasgow.In 1889 the assets were taken over by the Anglo-American Brush Electric Light Corporation, which had been set up as the British arm of Charles Francis Brush’s Brush Electric Company in America. It then became known as the Brush Electrical Engineering Company. In all, about 250 steam locomotives were built in addition to the tram engines. Production finished after the First World War and the company concentrated on transport-related electrical equipment, including tramcars, trolley buses and battery-operated vehicles. During World War 2, Brush Coachworks diversified into aircraft production, building 335 de Havilland Dominies for the Royal Air Force. Wing sections were built for Lancaster bombers and Hampden fuselages were overhauled. In 1957 it and Brush Electrical Machines were bought up by Hawker Siddeley to become the Brush Electrical Engineering Company Limited. As part of Hawker Siddeley Electric Power Group it then passed toBTR plc and became Brush Traction. It is now part of FKI Energy Technologies. The locomotive works was subsequently purchased by the Brush Traction Company and is still in use for the repair of locomotives. 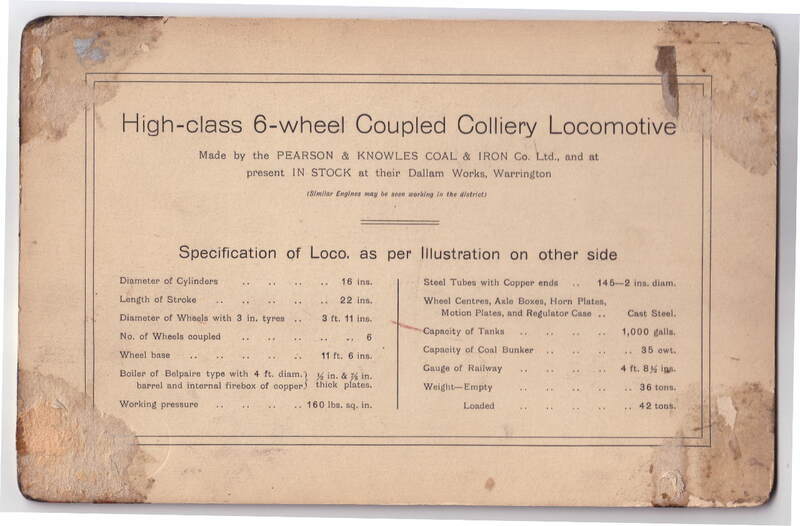 Pearson & Knowles Coal & Iron Co. Ltd.
We have recently acquired a card advertising locomotives manufactured by this company. It’s a company which I hadn’t heard of before and I don’t think they built many locomotives – if anyone knows differently, please let me know. Sunk on Coppull Moor between 1891 and 1900, Chisnall Hall Colliery was the largest pit in the area north of Wigan. It was owned by the Pearson & Knowles Coal and Iron Co Ltd, of Warrington and connected to the LNWR Wigan – Preston main line by a 1.5 mile private railway. In 1930, Pearson & Knowles merged with the Wigan Coal & Iron Co Ltd (and others) and all the collieries, including Chisnall Hall, became the property of the Wigan Coal Corporation. After nationalisation on 1 January 1947, a major rebuilding of the colliery was authorised by the National Coal Board. New headgear and new screens replaced the fairly ramshackle original structures and a coal washery was added. During the 1950s and early 1960s, well over 1000 men were employed, producing about 250,000 tons per year. The colliery closed on 24 March 1967, the last in the Wigan area other than small private mines. The washery and railway remained open for about 4 months, washing coal brought from Wood Pit, Haydock. Landscaping of the very large waste heap and colliery site was very thorough and won awards]. Almost no traces of the colliery or its railway survive. Andrew Barclay Sons & Co. was a builder of steam and diesel locomotives, based in Kilmarnock, Scotland, founded in 1840. It was only a couple of years later that he branched out on his own in the manufacture of his patented gas lamps In 1847 he set up workshops specializing in the manufacture of winding engines for the local coal mining industry, however the money from the gas lamp patent sale was never paid and the company and sequestration came the following year. By 1859 Barclay recovered from this set back and his newly formed company produced its first locomotive. Sometime around 1871 Andrew Barclay set up a second locomotive building business which was known as Barclays & Co., for his younger brother, John, and his four sons, this business remaining closely associated with that of Andrew Barclay. Again not all went well and the companies were declared bankrupt in 1874 and 1882 respectively. Four years after this last collapse Andrew Barclay’s business was relaunched as Andrew Barclay Sons & Co., Barclays & Co was being revived. Problems were not over, however, but in 1892 the firm took on limited liability as Andrew Barclay Sons & Co., Ltd. Just two years later Andrew was removed from control of the company which bore his name by its shareholders. The company was noted for constructing simple robust locomotives, chiefly for industrial use, and many of its products survive in use on heritage railways. A typical product would be an 0-4-0 with squared-off saddle tank. The Avonside Engine Company was a locomotive manufacturer in Avon Street, St. Philips, Bristol, England. The firm was originally started by Henry Stothert in 1837 asHenry Stothert & Company . Henry was the son of George Stothert (senior), founder of the nearby Bath engineering firm of Stothert & Pitt. Henry’s brother, also George, was manager of the same firm. An early order for the company was for two broad gauge (7 ft 0+1⁄4 in (2,140 mm)) 2-2-2 Firefly class express passenger engines Arrow and Dart, with 7 ft (2.1 m) driving wheels, delivered for the opening of the Great Western Railway from Bristol to Bath on August 31 1840. This was soon followed by an order for eight smaller 2-2-2 Sun class engines with 6 ft (1.8 m) driving wheels. When Edward Slaughter joined in 1841, it became Stothert , Slaughter and Company. By 1844 the works were named “Avonside Ironworks” and in 1846 built Avalanche the first of five six-coupled saddle tank banking engines for the GWR. Another large order came for ten broad gauge passenger 4-2-2s with 7 ft 6 in drivers and eight goods engines from the Bristol & Exeter Railway for the independent operation of that line from May 1 1849. In 1864, with Edward Slaughter still in control, the company took advantage of the Companies Acts and became the Avonside Engine Company Ltd. As if to mark the occasion, the works received a large order (the first from the GWR for some years following the development of Swindon Works for twenty 2-4-0 Hawthorn class engines with 6 ft drivers. Avonside was a very early British builder of the 4-6-0 type of tender locomotive. Ten narrow gauge freight-hauling 4-6-0 locomotives, of weight varying from 20 to 25 tons, were supplied to the Toronto Grey & Bruce Railway and the Toronto & Nipissing Railway.. These very successful and reliable wood-burning locomotives pre-dated the first significant British domestic railway 4-6-0, the Jones ‘Goods’, by over 20 years. Unfortunately detailed company records from this period have not survived. The Avonside company was unusual in that most of its production for over 40 years comprised main line locomotives largely for British railway companies but also for export. By 1881 main line locomotives were getting much bigger and exceeding the capacity of the manufacturing equipment. They made a positive decision to concentrate on the smaller locomotive types within the capacity of the existing plant. This change was to a degree forced on the company as a result of financial difficulties following Edward Slaughter’s death. Edwin Walker of the Bristol Engineering firm Fox, Walker & Co. joined Avonside and endeavoured to turn the company round, but without success. Walker was forced to liquidate the old company and form a new company with the same name to carry on the same business at the same address. At about this time the old firm of Fox, Walker & Co. was taken over by Thomas Peckett and became Peckett & Sons. In 1905 the Avonside firm left its historic home at St. Philips for a new plant at Fishponds but still with a small engine policy. 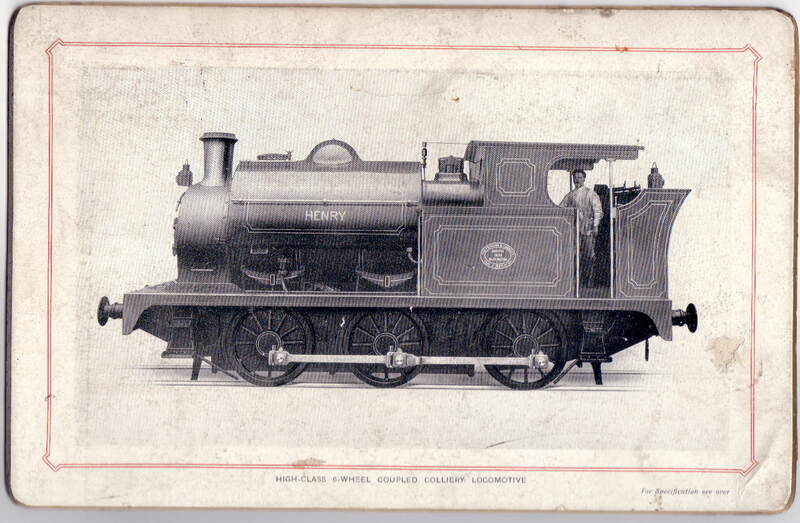 The company closed in 1934 and the goodwill and designs of the company were bought by the Hunslet Engine Company. Aveling and Porter was a British agricultural engine and steam roller manufacturer. Thomas Aveling and Richard Thomas Porter entered into partnership in 1862, developed a steam engine three years later in 1865 and produced more of the machines than all the other British manufacturers combined. In partnership with Porter, the steam roller they produced in 1865 was tested in Military Road, Chatham, Star Hill in Rochester and in Hyde Park, London. The machine proved a huge success. Aveling and Porter steam rollers were exported to Europe and as far afield as India and North America. In 1919 Aveling and Porter joined the Agricultural & General Engineers (AGE) combine. Production of Aveling and Porter steam wagons was transferred to Richard Garrett. In 1932 AGE went into receivership, bringing down Aveling and Porter with it. In 1933, Aveling and Porter combined with Barford & Perkins to form Aveling-Barford which continued to make steam and motor rollers. The rescue, part-funded by Ruston & Hornsby of Lincoln, involved the firm moving to Grantham, Lincolnshire, from the Rochester site. After World War II the company continued to make motor and steam rollers as well as expanding into other construction equipment. Aveling Barford is now part of the Wordsworth Holdings Group, a family owned company. The company is based in Grantham, and still trades under the name ‘Barford’ which uses a modern version of the Aveling-Barford ‘prancing horse’ logo. Barford manufacturers and sells a wide range of site dumpers. Aveling & Porter built more steam rollers than all the other manufacturers combined. They also built traction engines and steam wagons. Another example of Aveling and Porters engineering skills can be seen in the massive covered slips at Chatham Dockyard. These Leviathans of steel pre-date the great London train sheds of St. Pancras, King’s Cross and Paddington—traditionally understood to be the oldest and largest steel framed structures of the time. Two Aveling and Porter products are found in The Railway Series books by the Rev. W. Awdry and the TV Series based on the books: George the Steam Roller and Fergus the Railway Traction Engine. Black, Hawthorn and Company was a steam locomotive manufacturer with a works situated in Gateshead, Tyne & Wear, UK. The Quarry Field Works was opened in 1835 by John and Ralph Coulthard, known as John Coulthard and Son which became R. Coulthard and Company in 1853 when the partnership was dissolved. Their first loco was York, Newcastle and Berwick Railway number 156, a 2-4-0 to the Jenny Lind pattern. There followed more of the same and several 0-6-0 engines. Although the works numbers went up to 100, probably only twenty were new, since the company carried out a great deal of rebuilding work. By 1896 over a thousand engines had been built when the firm was taken over by Chapman and Furneaux, A further seventy were produced before closing in 1902, with drawings, patterns and goodwill being bought by R & W Hawthorn and Leslie of Newcastle..
Beyer, Peacock and Company was an English locomotive manufacturer with a factory in Gorton, Manchester. Founded by Charles (formerly Karl) Beyer and Richard Peacock, it traded from 1854 until 1966. It received limited liability in 1902, becoming Beyer, Peacock and Company Limited. Cannock Chase Colliery loco named ‘McClean’ after the founder of the company and was number 28 of 1856, acquired new. The two entered into partnership, opening a Market Street office and there formulated plans for a new Gorton Foundry. The source of most of their finance was a banker, Henry Robertson, who became a ‘sleeping’ partner. Twelve acres of land were purchased, next to the railway at Gorton and the first brick of the new workshop was laid on March 14th., 1854. The first recorded meeting of Beyer. Peacock and Company was convened on January 12th.. 1855, in Gorton. The following month, the far from sleeping partner, Robertson, launched the first sales campaign and obtained an order from the South Staffordshire Railway for four engines, each to weigh twenty five tons and cost £2750. Only sixteen months after construction of the factory was commenced, the first Beyer-Peacock Locomotive was completed, delivery being effected on July twenty-first, 1855. Orders followed quickly, from the East Indian Railway; the Royal Swedish Railway; the Lombardo and Venetian Railway; and many others, throughout Europe and globally, from Peru to Burma. As orders increased, so did the size of the factory. It is a testament to the far-sightedness of Beyer and Peacock that, for at least the next fifty years. development of the factory proceeded precisely on the lines set out by the two engineers in 1854. For many years the last surviving industrial example of this manufacturer could be found at Shelton Iron & Steel Works, Staffordshire. The plate-steel jib only moves in the horizontal plane.